The notification bar on top is one of the most useful part of an Android mobile phone. Up there, you get notifications for almost everything. When you have missed calls, new messages as in SMS/Gmail/Facebook for example, updates for apps, alarms coming up etc, all of them are shown up in the navigation bar. I find making use of the navigation bar more than often. But there are times when messages are displayed in the navigation bar and you tend to ignore them until later. But sometimes, we mistakenly swipe them away. If we did not pay much attention to the notification, before swiping it away, that particular notification seemed to be lost for ever. Turns out that is not the case. 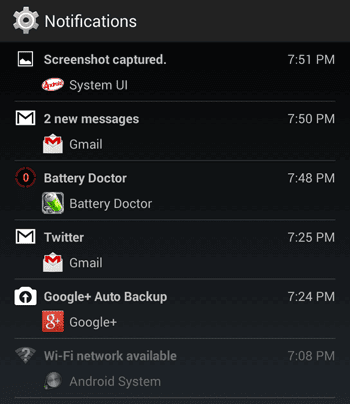 Notifications are saved as an archive in Android. Go to your App Drawer and switch to the tab that says "Widgets". Scroll or slide in through the widgets, till you find something called "Settings shortcut". Touch and hold to pick up that widget and place it in your home screen. 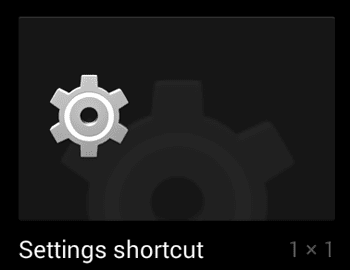 A "Settings shortcut" screen is displayed from where you can select a shortcut for your just placed widget. Click on the one that says "Notifications" by tapping on it. Now, the next time you click the "Notifications" widget that you placed in your home screen, all your notification history or archive is displayed. Note: The screenshots are from Nexus 4 Android phone with KitKat 4.4. This tutorial works for phones with Android 4.3+. How to Clear Those Archived Notifications History? The notifications history that you reach from your notification widget is there from your last phone restart time. To clear the collected notifications, just restart your phone. After restarting, tap on the Settings widget once again to double check. You will find that your notification archive has been cleared. Once new notifications start coming up, those are again accessible from the "Notifcations" shortcut widget on your homescreen.